Alaska employees and Habitat for Humanity volunteers came together in March to donate furniture from the former Sandstone Motel. 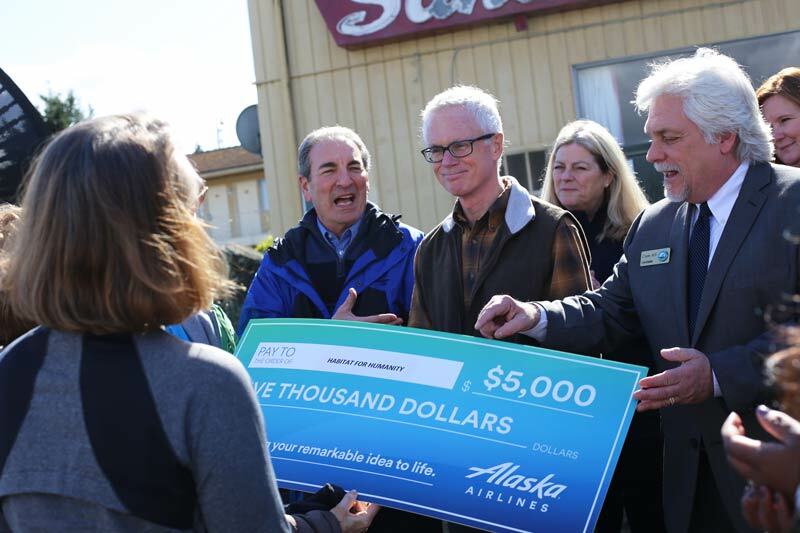 As Alaska Air Group breaks ground on a new office building near Sea-Tac Airport, we’re giving back to our communities and keeping as much as we can out of landfills. Earlier this spring, Alaska teamed up with a group of volunteers from Habitat for Humanity to clear out each room of the former Sandstone Inn in SeaTac, across the street from Alaska’s Corporate Headquarters, to get it ready for the construction of the new office building. Over two days, Alaska and Habitat volunteers emptied more than 120 guest rooms, the restaurant, lounge, laundry room, lobby and several offices — enough to fill two semi-trucks, plus a box truck, full of furniture. Some of the items donated include several couches, mattresses, lamps, desks, end tables, phones, mirrors and artwork. A truckload of televisions and computer equipment were also collected to be e-cycled. The linens, irons and lampshades were given to Goodwill for a new home. With a donation of $5,000 and Alaska employees volunteering with the Habitat team, the effects of that generosity and hard work will help more families achieve the strength, stability and self-reliance they need to build better lives, she said. Find a local Habitat ReStore and organization near you.